The Mercedes-Benz G-Class started its life as a military vehicle and has transformed over the years to become an incredibly luxurious SUV with excellent off-road capability and outstanding versatility. The interior of the iconic Mercedes-Benz G-Class is loaded with luxury features, advanced technology and offers spacious seating for up to five passengers and a large cargo area. The outstanding versatility, impressive capability and iconic style of the Mercedes-Benz G-Class make it an easy pick for a used luxury SUV in Newport Beach, CA if you are looking to stand out among other vehicles on the road. Keep reading to learn more about the engine specs and performance features of a used Mercedes-Benz G-Class. Over the life of the Mercedes-Benz G-Class, drivers have seen many innovative engine options and available performance features. For instance, a used 2017 Mercedes-Benz G-Class AMG 63 in Newport Beach, CA uses a 5.5-liter twin-turbo V8 that cranks out an incredible 563 horsepower and a whopping 561 lb-ft of torque. Performance features offered with this engine include 20-inch wheels, a performance-tuned suspension and larger brakes. The 2017 Mercedes-Benz G-Class AMG 63 also receives a permanent all-wheel-drive system that continuously sends power to all four wheels to help give you the superior traction control you need to conquer almost any road condition or terrain. 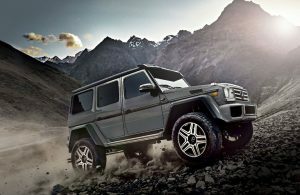 To learn more about the Mercedes-Benz G-Class in Newport Beach, CA, stop into Phillips Auto or give us a call.